It's been a busy week, with the top two publicly traded Canadian space companies both reporting their quarterly earnings and a variety of other public, private and corporate advocates lining up their wish lists and concerns just in time for the upcoming Federal budget, expected over the next couple of weeks. Telesat CEO Daniel Goldberg. Photo c/o Space News. Canada's largest space company, Ottawa based Telesat, had a quiet month but did announce that it had awarded two launch contracts to Hawthorne, California based SpaceX. As outlined in the February 26th, 2016 SpaceFlight Now post, "Telesat launch agreements awarded to SpaceX," the two satellites, Telstar 18V and Telestar 19V, are expected to launch as payloads on board separate SpaceX built Falcon 9 rockets sometime in 2018. And, at least according to the February 25th, 2016 Space News article, "Telesat to order two small Ka-band satellites to test constellation," Telesat was also about to order two small Ka-band telecommunications satellites to be launched into low Earth orbit in 2017. These satellites would be designed to validate technologies the company would apply to a global constellation of broadband spacecraft, which the article indicated could potentially be from Richmond, BC based MacDonald Dettwiler (MDA). For more on the most recent Telesat quarterly earnings conference call, check out the February 25th, 2016 Telesat press release, "Telesat Reports Results for the Quarter and Year Ended December 31, 2015." For more on what some Canadians think about domestic space companies outsourcing to US launch providers, check out the February 29th, 2016 SpaceRef Canada post, "Op-Ed - A Need for Canadian Space Access." MDA CEO Friedmann. Photo c/o Space News. MDA president Daniel E. Friedmann, who runs Canada's second largest space company, has come out publicly with a statement that the California based MDA subsidiary Space Systems Loral (SSL) will be going after US military contracts, at least according to the February 25th, Space News post, "MDA Corp. to U.S. government’s satellite builders: We’re on our way." 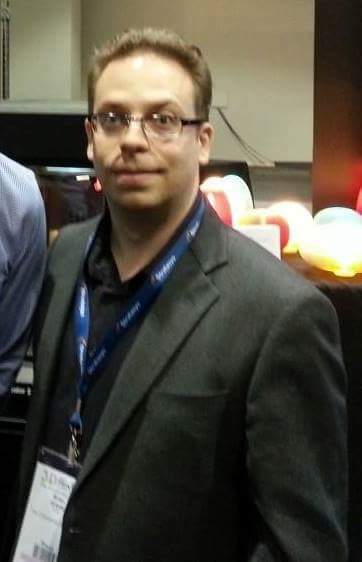 The article quoted Friedmann, who until recently only really seemed to go on the record to complain about the Canadian government, as stating that the "US government dwarfs all other commercial and government markets for satellites" and he wants a piece of it. "SSL’s lack of access to U.S. military work is a handicap MDA can no longer accept," he said during the most recent quarterly MDA conference call, on February 24th. It's worth noting that MDA/SSL already has substantial access into the US civilian space sector, as illustrated most recently in the February 25th, 2016 MDA press release, "SSL selected to provide design work for NASA JPL asteroid mission" and the February 29th, 2016 MDA press release, "SSL developing robotic sample handling assembly for NASA Jet Propulsion Laboratory Mars 2020 project." For a full account of the call, it's worth checking out the February 24th, 2016 MDA press release "MDA reports fourth quarter and full year 2015 results." An interesting overview of the tax consequences of the COM DEV sale to Honeywell and the spin off of its exactEarth subsidiary, based upon the December 23rd, 2015 SEDAR filing. 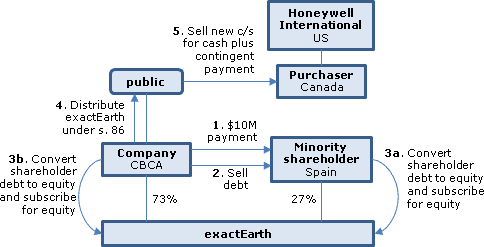 "Circular of COM DEV International Ltd. (the “Company” for its spin-off of exactEarth Ltd. (“exactEarth”) and its acquisition by Honeywell Limited (the “Purchaser”)" from the Taxinterpretation.com website. Canada's third largest space company COM DEV International is gone, having been delisted from the Toronto Stock Exchange (TSX) on February 9th, 2016 after its purchase by American multinational conglomerate Honeywell International. But it has not been forgotten. As outlined in the February 29th, 2016 Space News post, "Why didn’t Canada put up a fight for Com Dev?," there are many in Canada who are questioning the Federal government's decision not to interfere with the sale. According to the article, the sale "came as the Conservatives were occupied trying to be re-elected. Parliament was not in session... (and, because of the election) federal government bureaucrats, who should have raised warning signs about the COM DEV sale, didn’t act." NSERC president Mario Pinto. Photo c/o University Affairs. And finally, the president of the Natural Sciences and Engineering Research Council (NSERC), which isn't a private corporation, but is instead a Federal government bureaucracy bolstered by the recent election (especially the Liberal campaign promises to allow government scientists to comment publicly on their work), has released an interesting shopping list of department priorities under the title "NSERC 2020: A Strategic Plan." As outlined in the January 19th, 2016 University Affairs article, "NSERC’s big plans for the next five years – funds pending," many of the NSERC 2020 recommendations are dependent on the upcoming Federal budget, expected sometime over the next few weeks. As one of Canada’s three major funding councils (along with the National Research Council and the Social Sciences and Humanities Research Council), NSERC has a budget of $1.1Bln CDN, which goes to support the research of some 11,000 professors and 30,000 students in natural sciences and engineering. This mandate also provides for a lot of overlap with the Canadian Space Agency (CSA) which once had a similar mandate to support space focused research, but a far smaller budget (only a portion of its $350Mln CDN annual allocation). As a result of the 2012 Emerson Aerospace Review most of the CSA R&D work has reverted to the funding councils. For a partial list of the ones which remain, check out the CSA Announcement of Opportunity webpage. How will these stories develop? Only time will tell. But time will also benefit from context. To develop the appropriate context, check out future posts from the Commercial Space blog. But while we were happy enough to acquiesce to the COM DEV sale, there are limits to the types of sales we allow. For example, we don't allow foreign ownership of our chartered banks and in exchange for that quasi-monopoly our banks have acceded to some relatively stringent regulations which were certainly useful for cushioning our economy from the worst vicissitudes of the global meltdown of 2008. And, in 2009, we also refused to allow BC based MacDonald Dettwiler (MDA) to be purchased by US based Alliant Techsystems (ATK). 2000 was a slightly better year for COM DEV. Qualcomm invested $6Mln CDN as part of a licensing deal and shares went back to $12.65. In November the company announced anticipated growth from its M/ERGY high speed mobile product and turned a profit of $6.9Mln CDN for the year. A few weeks later the federal government under Prime Minister Jean Chrétien invested another $2.5Mln in the company to further develop the National Research Council (NRC) work done on surface acoustic wave technology. COM DEV stock price and volume of trades on the Toronto Stock Exchange (TSX) covering the period from April 9th, 1999 until February 8th, 2016, when COM DEV was delisted from the TSX. As shown in the chart, COM DEV stock peaked on November 24th, 2000, dropped precipitously afterwards and never regained those heights. Graph c/o FactSet. Three months later the company cut its wireless components business and posted losses yet again. This time shares dropped like a rock to $3. Consolidation was inevitable and just five days before the catastrophe of 9/11 they announced that they would be selling off their plants in England, China and New Brunswick. Evidently the stock price had already fallen so low during the summer of 2001 that the events of 9/11 didn't have any immediate impact. Things were already pretty desperate. They lost $16Mln on the year and sold off their RF Conditioning and satellite ground station component business to Montreal's Mitec, essentially returning the company's very first business back to its home town. By the summer of 2002 COM DEV share value was so low O'Donovan seized the opportunity and started to buy back stock. He then sold the company's broadband business, for an $11Mln CDN loss, to Axio Wireless of California. COM DEV shares plummeted to $1.53. 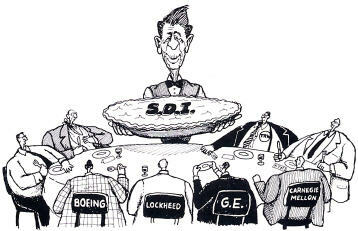 In the spring of 2003 the next big trough in the sky was the US Strategic Defense Initiative (SDI). This represented a massive cash-cow for any company who could acquire a piece of the action. The so-called "Star Wars" had been on contractors' radar since President Ronald Reagan had first expressed his desire to put an impenetrable umbrella over the United States in the 1980s. SDI, or the "Star Wars" program, as it was called, was generally expected to cost upwards of $1 trillion dollars when it was developed in the 1980's. But the program was derailed by the Gramm-Rudman-Hollings Balanced Budget and Emergency Deficit Control Act of 1985 and the Balanced Budget and Emergency Deficit Control Reaffirmation Act of 1987, both of which coincided with the growing public perception that a "peace dividend" or tax surplus would develop as defence programs were curtailed or cancelled in the aftermath of the fall of the Soviet Union. But after the events of September 11th, 2001, military spending again increased and all sorts of old ideas were back on the table. Graphic c/o The Space Handbook. In the ensuing decades the idea had continued to stew in the corridors of Washington and it was once again back on the front burner as the repercussions to Western economies and security had been laid bare by the attacks of 9/11. Enormous pressure to join in on the program was brought to bear on Ottawa by the Bush Administration. It became a contentious political issue in Parliament, but needless to say, companies like COM DEV were in dire need of a boost. The company publicly advocated for a role for Canada but the cards weren't going to fall their way. By the summer of 2003 COM DEV shares were at just $1.25. The CIBC and National Banks both stepped in and bought $9.5Mln worth, so that COM DEV could pay off an old promissory note it had made in a complex investment south of the border in 1998. Between 2004 and 2009 COM DEV shares bobbed up and down from as low as $2.60 and as high as $6. The surging Canadian dollar hurt exports, but the company had made some smart moves hedging currency and was able to weather this latest storm. The advent of HDTV helped, as did contracts with the Europeans worth close to $15Mln and in Asia worth $9Mln. According to financial house Guru Focus, over the past 13 years, the median trailing annual dividend yield of COM DEV stock was 1.64%. The company share price at the time of writing ( in early February 2016, just before the firm was officially delisted from the Toronto Stock Exchange on February 9th) is $5.62, but the Canadian dollar is once again down to about 75 cents US, which made the purchase of COM DEV particularly attractive. The timing of the purchase has raised some questions about "getting it done" while Trudeau's cabinet were still locating their offices. i.e. while no one was paying attention. But based on historical fact it seems more likely that no one in Ottawa really cares. Last Week: From Strength to Strength. At Least for Awhile as part 3 of "A Short History of COM DEV International" continues! Next Week: Epilogue as "A Short History of COM DEV International" concludes! Kepler Communications, a small, Toronto, Ontario based start-up focused on building commercial “off the shelf” satellite re-transmitters (or "repeaters"), will be relocating to Seattle for the next three months. Jeff Osborne and Wen Cheng Chong, two of Kepler's four co-founders, at the Space Frontier Foundation’s Northeast Regional NewSpace Business Plan Competition (BPC) in New York, NY. As outlined in the October 27th, 2015 press release, Kepler Communications Wins NewSpace Business Competition in Manhattan," Kepler received first place at the event. 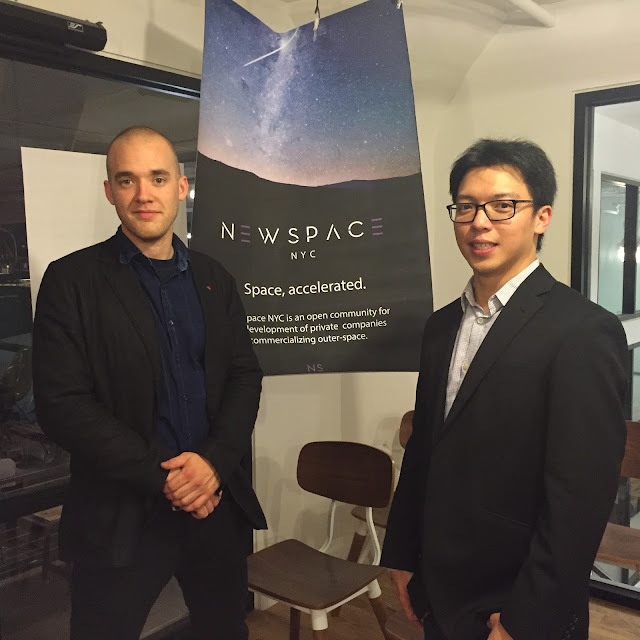 Photo c/o NewSpace NYC. As outlined in the February 23rd, 2016 Geekwire post, "Here are the 9 startups in the Techstars Seattle 2016 class," Kepler will join eight other start-ups for an intensive three month internship to hone their solutions at the Seattle based Techstars Seattle accelerator. At the end of the program, they’ll pitch their products to prominent investors at Demo Day on May 18th. As outlined in the article, the latest Techstars cohort will include startups focused on data analytics, gaming, drones, and other industries with a strong presence in the Pacific Northwest. According to Kepler co-founder Jeffrey R. Osborne, "we have relocated to Seattle for this program, which is a major boost for us because of the space industry already developed out here. We will be here until the end of the program in May after which we will return to Toronto." Samer Bishay - a former systems engineer at MacDonald Dettwiler (MDA), who moved on to become the president of northern telecommunications provider Ice Wireless, wholesale VOIP services provider Iristel and upstart wireless cellphone company Sugar Mobile. Tony Lacavara - The entrepreneur who created Wind Mobile (Canada’s fourth-largest wireless carrier) once acted as chairman of the board for NewSpace company UrtheCast and currently serves as chairman of Globalive Holdings (a privately held Canadian communications and investment company), who was last profiled in the January 26th, 2016 post, "Tony Lacavera Has a New $100Mln Venture Capital Fund." The York Angel Investors - Several of the approximately 50 or so members of this organization have also provided assistance or contributed funding to Kepler. Canada is a latecomer to the idea of funding space activities through the use of traditional venture funding mechanisms. Seen above is a December 3rd, 2013 BBC News panel discussion on investing profitably in NewSpace start-ups with Virgin Galactic founder and chairman Richard Branson (on the left, connecting "via satellite") and Space Angels Network managing director Chad Anderson . As outlined in the February 7th, 2016 post, "2016 Could Be a Big Year for Space: Is Ottawa Paying Attention?," both Branson and Anderson have a decade long history funding NewSpace start-ups in the US and the UK. The Space Angels are even coming to Canada. As outlined in the February 19th, 2016 post "NRC-IRAP Aerospace Sector Team Partners with the Space Angels Network," the National Research Council -Industrial Research Assistance Program (NRC-IRAP) aerospace sector team has announced a partnership with the Space Angels to provide value added advisory services to Canadian space technology (CST) small and medium enterprises and serve as an introductory service for Canadian companies looking to receive funding from Space Angel investors. Screen shot c/o Chad Anderson. Being accepted for Techstars wasn't the only important news for Kepler this year. As outlined in the January 30th, 2016 Betakit post, "Ontario Centres of Excellence Grants $180,000 to Four Entrepreneurship Hatchery Startups," the company was one of four firms working out of the Entrepreneurship Hatchery, the University of Toronto engineering’s accelerator for student business ventures, to receive funding though the Ontario Centres of Excellence’s (OCE) SmartStart seed fund. The Start@UTIAS program originated last year through former Aastra Technologies CEO Francis Shen (who made the initial $1Mln CDN contribution to begin the fund) and I don't think we've publicly thanked them for the initial financial support we received through that program. I think it would mean a lot to them to have that recognition. A good case can be made that the fund raising route taken by Kepler Communications through a series of public and private incubator and accelerators and past a variety of angel and institutional investors is a template for future commercialization and fund-raising in the space industry. But while this route may not be the easiest or the only route to the top, there's no doubt that, at least for Canada, this new path is well worth exploring. For those interested in learning more, Kepler Communications was first profiled in the August 31st, 2015 post, "Canadian NewSpace Start-Up to Offer Commercial Satellite Repeaters." Jean-Claude Piedboeuf. Photo c/o Linked-In. According to Jean-Claude Piedboeuf, the Canadian Space Agency (CSA) director general of space science and technology, the real purpose of the Space Technology Development Program (STDP) is to "prepare the space sector in Canada for upcoming global opportunities." Piedboeuf made the comments during a recent interview with the Commercial Space blog, which says more than anything else about the recent federal transfer of power from the conservatives to the liberals. Perhaps, as outlined in the the November 6th, 2015 Huffington Post article, "Liberals Unmuzzle Canadian Scientists, Promise They Can Now 'Speak Freely,'" Piedboeuf was simply following through on a Liberal party campaign promise to allow government scientists and experts to comment on their work to the media and the public. But Piedboeuf, who started out as an assistant professor in the department of mechanical engineering at the Ecole de Technologie Superieure before moving on to become a post doctoral fellow at the Technische Universität München, then on to an assistant professorship at the Royal Military College of Canada before joining the CSA in 1996, would prefer to remain on point. The core of the program is an assessment of the technology readiness level of any Canadian technology needed for a specific program. CSA technology readiness levels, as outlined in the June 8th, 2015 CSA announcement of opportunity on the "Space Technology Development Program Industrial Capability-Building Contribution: STDP AO3." Screenshot c/o CSA. 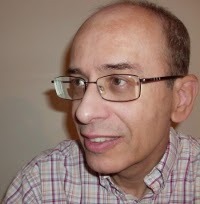 "Our costs escalate when the tech isn't ready," according to Piedboeuf, who is quite familiar with situations where the technology required is only at the concept or formulation stage (TRL-2) but needs to be quickly brought up to the point where hardware has been validated in either a laboratory (TRL-4) or in the actual, operational environment (TRL-5). "We need to know what needs to be done to make an idea into an operational tool, which we can use," said Piedboeuf. He mentioned the testing which went into the Neptec Tridar, which started out under a rigorous Earth based testing regime before being tested on three space shuttle flights and eventually getting picked up for the Orbital Sciences Corporation (OSC) Cygnus spacecraft, as outlined in the January 3rd, 2013 post, "What's Next for Neptec?" According to Piedboeuf, the CSA doesn't develop technology under the STDP unless it has good potential for a mission. For a useful list of upcoming CSA missions, check out the CSA Announcements of Opportunity web page. Canadian flag carrier Air Canada, in a move facilitated by the Federal and Quebec governments, has signed a letter of intent to purchase up to 75 new C-Series commercial aircraft from imploding aerospace giant Bombardier Inc. The deal comes on the heels of a series of disasters for the company, culminating in an appeal from Bombardier management to the Federal government for financial aid. Going up. Perhaps... 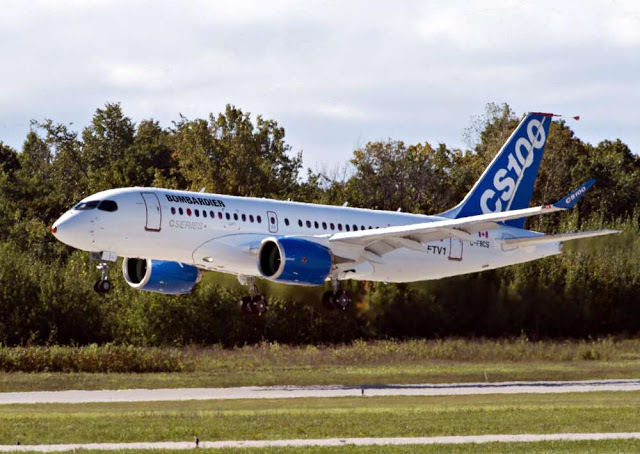 The first of the Bombardier C-Series, takes off on its maiden test flight at the Bombardier facility in Mirabel, PQ on September 16th, 2013. As outlined in the November 21st, 2015 iPolitics post, "Mr. Trudeau’s Bombardier problem," the situation has been a topic of discussion in the Liberal caucus since transport minister Marc Garneau put the kibosh on the sale of Bombardier jets to Toronto Island based Porter Airlines last November. Photo c/o Canadian Press /Ryan Remiorz. Bombardier's hunger for Canadian taxpayer funds carries no small amount of irony, given the company's zeal for exporting Canadian taxpayers' jobs under the oft-repeated mantra of cost-cutting. The Air Canada/Bombardier deal is essentially an out-of court settlement to a lawsuit filed by the Quebec government against Air Canada last year. As outlined in the February 18th, 2016 Canadian Press article, "Quebec getting heat for dropping lawsuit against Air Canada in C-Series deal," the Quebec government had accused Air Canada of violating the Air Canada Public Participation Act (which requires Air Canada's maintenance work to be done in specific Quebec locations) by moving some heavy maintenance work to companies in the US, Singapore, Israel and Ireland. Air Canada appealed to the Supreme Court, but lost. As part of the C-Series deal, Air Canada and the Quebec Government have agreed to end their litigation and Air Canada has pledged to perform heavy maintenance on the C-Series in Quebec for the next 20 years. In exchange, the Federal government has agreed to remove the Quebec maintenance requirements from the Air Canada Act. The 25% foreign ownership limit and the requirement that Air Canada’s headquarters be located in Montreal will stand, however. Bombardier isn't just having trouble with its airplanes. 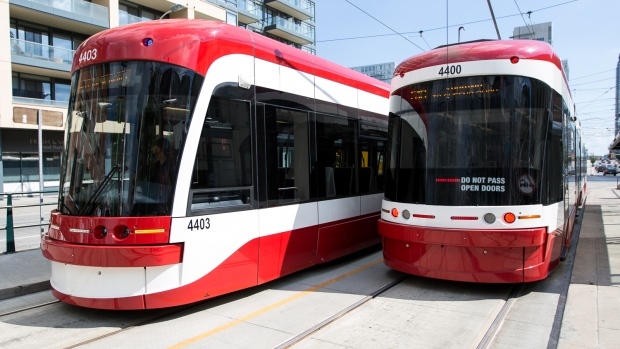 Shown above are Bombardier streetcars in Toronto, ON., which haven't been arriving to replace the existing Toronto Transit Commission (TTC) inventory of worn out streetcars as fast as the City of Toronto would have liked. As outlined in the March 4th, 2013 Canadian Press article, "Bombardier sued over alleged train defects in Germany," at least one other Bombardier client has resorted to the courts for satisfaction. Photo c/o David Donnelly/CBC. Oddly enough, both transport minister Marc Garneau and Air Canada CEO Calin Rovinescu have publicly denied that there was any Federal government pressure to make the C-series purchase. The failure of the C-Series regional jets. Originally marketed as having quieter engines, lighter air-frames and better fuel economy than other aircraft, the program now faces disaster. The C-Series' competitive advantage has vanished due to both the large drop in global oil prices as well as stiff competition from titans like Boeing and Airbus. Bombardier has received no new C-Series orders since 2014 and customers who ordered aircraft in 2009 still await delivery. As outlined in the February 17th, 2016 Globe and Mail post, "Bombardier gets lifeline as Air Canada places order for C Series jets," the new Air Canada order may not provide much reprieve, especially after factoring in industry rumours that Air Canada will be given a 60% discount on each aircraft, paying just $30Mln USD ($41.3Mln CDN) of the $72.4Mln USD ($99.7Mln CDN) list price. An impending $50Mln CDN lawsuit from the City of Toronto against Bombardier over shoddy workmanship and unfulfilled deliveries of the cities' new streetcars. As outlined in the October 28th, 2015 CBC News post, "TTC to sue Bombardier over delayed streetcars," the company has been struggling in this area as well. Bombardier has announced layoffs in Canada and other worldwide locations over the next two years, as outlined in the February 17th, 2016 Canadian Press story "Bombardier Layoffs To Hit 7,000 In Canada, Europe." With its share price hovering at around $1 CDN (its lowest since 1989), the company is also in danger of being de-listed from stock exchanges worldwide, which would certainly imperil any future financing efforts. And, as outlined in the November 19th, 2015 National Post article, "Bombardier Inc gets boost to balance sheet with $1.5-billion from Quebec pension fund," the company is still projected to run out of cash in the latter half of this year. It's worth noting that there is simply not enough money in the Federal coffers to fund every worthy cause and choices will certainly need to be made in the lead up to the next Federal budget. As outlined in the February 21st, 2016 CTV news post, "Notley asks for oilsands aid as feds mull Bombardier bailout," Alberta is also asking for assistance. Screen shot c/o CTV. As the Justin Trudeau government ponders whether to load even more taxpayer billions onto Bombardier's sinking ship, perhaps it should heed the lessons of the auto industry downturn of 2009. In that year, the Canadian government bailed out both Chrysler and General Motors by purchasing $13.7Bln CDN of preferred shares in the flat-lining auto makers. In April 2015, the former Harper government sold its remaining shares. As outlined in the April 7th, 2015 Globe and Mail article, "Canadian taxpayers lose $3.5-billion on 2009 bailout of auto firms," that investment didn't work out so well. As governments kept feeding billions to withering dinosaurs, the industry's true rebirth came from elsewhere. In 2010, Tesla Motors (in partnership with Toyota) purchased the defunct NUMMI auto assembly plant in Fremont, California. Reborn as 'The Tesla Factory,' this facility now produces electric vehicles like the Tesla Model S sedan and the Tesla Model X SUV. The Tesla Factory employs over 3,000 workers and has produced 33,117 vehicles as of late 2015. Tesla Motors innovative ascension continues, with the company opening a factory in the Netherlands 2013 and preparing to open a plant in China later this year. The Tesla Factory in Freemont, CA. According to the company website, "the Tesla Factory in Fremont, California is one of the world’s most advanced automotive factories, containing 5.3 million square feet of manufacturing and office space." Photo c/o Tesla. However, the jewel in Tesla's crown will be the so-called 'Gigafactory 1' currently being built near Reno, Nevada. Begun in 2014 (in partnership with Panasonic) and scheduled to begin operations this year, this $5Bln USD ($6.88Bln CDN) facility will produce lithium-ion batteries for electric vehicles as well as Tesla's Powerwall home battery system. Gigafactory 1 is expected to employ 6,500 workers. The true lesson of the 2009 auto industry downturn is that genuine innovation, growth and jobs come from supporting innovative new companies and not squandering billions of taxpayer dollars into defunct, fossilized old enterprises.The US government stands to make far more return from its investment in Tesla Motors than the Canadian government did for its support of GM and Chrysler. Rather than shoveling even more mountains of cash into the maw of the Bombardier clan, perhaps the Trudeau government should focus on helping the 7,000 soon-to-be-unemployed workers and their families, both in the short and long term. It could also more aggressively support innovative new companies that could offer new jobs for these discarded men and women. MIT Aeronautics and Astronautics department head Jaime Peraire interviews SpaceX and Tesla CEO/founder Elon Musk on October 24th, 2014, at the final session of the AeroAstro 1914-2014 Centennial Symposium. Musk talked about electric aircraft. Screen shot c/o Every Ashley Dove - Jay Video. As the son of a manufacturing worker whose job was exported to Mexico some 17 years ago (he worked for American Standard, which moved a number of facilities from Canada to Mexico around that time), the author has seen first hand the effects of such mass layoffs as are expected to occur at Bombardier. While the government of seventeen years ago showed not a flicker of concern as it blundered through an earlier round of private sector layoffs, the current Justin Trudeau government has an opportunity to make a difference by aiding the unfortunate and cutting off old enterprises that are past their best-before date. Trudeau could make his own contribution towards the 'Just Society' as his father did long ago. The next two years would see COM DEV move from strength to strength in large part thanks to a string of work from the Canadian government. They began 1992 with a $3Mln CDN grant to develop signal processors; they also purchased equity in two satellite companies, Orion and Iridium with $15Mln CDN in financing from the government Export Development Corporation (EDC). The ESA ENVISAT, which was launched on 1 March 2002 aboard an Ariane 5 rocket from the Guyana Space Centre into a Sun synchronous polar orbit. 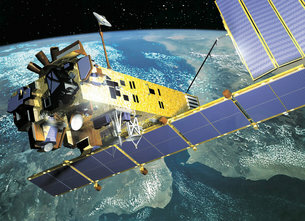 Envisat was put into orbit to support a variety of European remote-sensing satellite missions. As outlined in the January 24th, 2001 SpaceRef.ca post "Technical briefing on the design and construction of ENVISAT," a number of Canadian companies, including EMS Technologies, ABB-Bomen, MacDonald Detwiller (MDA) and COM DEV each contributed components to the satellite. Graphic c/o ESA. 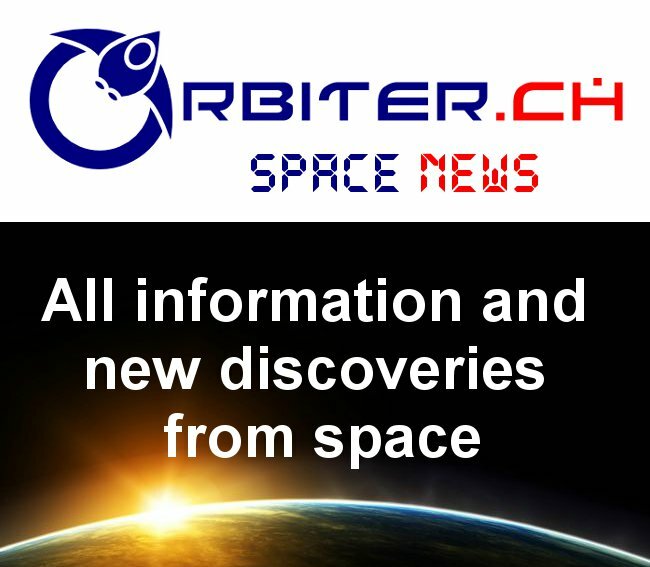 By September they had won a $7Mln CDN contract with the European Space Agency (ESA) and they ended the year with another Federal grant for $8.7Mln CDN. Four months later the CSA awarded them a $3.7Mln CDN contract. In the space of a few weeks in the fall of 1993 they were awarded a $6Mln CDN contract with the ESA, thanks to the Canadian government investing $58Mln in the Environmental Satellite (ENVISAT) program, followed by a $13M contract to do work for the DND on ships. They were also now a partner in the massive Canadian based RADARSAT consortium: 1992 and 1993 would be unsurpassed years for Ottawa's generosity to COM DEV. However, 1993 would end with a serious jolt to the company when a lawsuit was dropped on them by Loral Corporation, which claimed that COM DEV had breached one of their patents. The details of the claim are unknown but way back in the early 1970s one of COM DEV's first customers was Ford Aerospace Corporation, which was then purchased by Loral in 1990. The patent being contested was awarded to Ford in 1984, by which time COM DEV had been dealing with the company for the better part of a decade. O'Donovan had spent a lot of time in the early 80s pursuing improvements on Ford technology. The work had evidently not caused any consternation south of the border until Loral took over. By April the court had ruled twice against COM DEV and some important orders were in jeopardy of being delayed, or worse. By the end of the year 8% of the 683 staff had to be laid off. As outlined in the September 4th, 2014 Space News post, "Loral Agrees To Pay ViaSat $100M To Settle Patent Suit," Loral has been involved with at least one other patent case against a Canadian aerospace company. Screenshot c/o Space News. The following summer, the Toronto Dominion (TD) bank stepped in with $20Mln CDN to assist and help the company work on joint ventures with the Research in Motion (RIM) Group. At this point, COM DEV had purchased 22% equity in RIM and, over the following month COM DEV split into two companies, one to deal with personal communication devices the other to continue the main business. In 1996 things were looking up again and a joint venture with the Xian Institute in China for comm-sats was announced, along with a new facility in Shaanxi province. Over 1000 people now worked for COM DEV and O'Donovan started making noises about going public. On December 10th 1996 the company offered up about eight million shares for an initial IPO of $8.25 per share. O'Donovan was apparently not happy with the price, thinking it was too low. He was soon shown to be correct, albeit briefly. Within eight weeks COM DEV shares were trading at $16.75 and by August they were sky-high at over $40. If you were one of the people who paid that price you were destined to wait a long time to make your money back. But business in 1997 was brisk. Several multi-million dollar contracts, an investment in Bill Gates' proposed Teledesic "internet in the sky" (remember that?) and the construction of a third facility in China all brought more jobs. Sales for the year were $187Mln CDN. Early in 1998 they bought Skybridge of Maryland (with no complaints or obstruction from south of the border) and also formed a joint venture with Ball Aerospace to develop laser communication for satellites. First quarter sales were up 50% from the previous year and yet the company share price dropped to $15.50 because it was starting to lose market share on its involvement with PCS phones, touted at the time as "an all-in-one wireless phone, paging, messaging, and data service." An early version of the "internet of things" was Teledesic, a company founded in the 1990s specifically to build a low Earth orbiting commercial broadband satellite constellation for internet services. Supported by cellular pioneer Craig McCaw, Microsoft co-founder Bill Gates, and Saudi prince Alwaleed bin Talal, and often referred to as the "internet in the sky" project, the original $9Bln USD ($12.4Bln CDN) 1994 proposal was scaled back in 1997 and suspended in 2002. Graphic c/o Wikipedia. By June things got worse when Motorola became involved in Gates' "Internet in the sky" project, delaying a line of subsystems needed by COM DEV. Layoffs ensued in England. The following month things turned especially ugly when one of the company directors sold off two-thirds of his shares just ten days before the shareholders were made aware that earnings were going to be extremely low. What had been a market cap of $746Mln CDN a year earlier was now down to $284Mln CDN. To the company's credit, the rogue director was ordered to resign and make amends by returning most of his "winnings;" an unprecedented move at the time, which was roundly applauded by the market. Adding to the problems was the bankruptcy of Iridium, the owner of the wildly optimistic proposed global satellite phone service. Lured by the image of entire constellations of satellites COM DEV had invested heavily in the company. The same year they purchased 3dbm, another American company, for $17Mln only to close it down a year later. But despite these bruises O'Donovan was bullish. He still believed in the future of his company. The share price was down to $4 and in the summer of 1999, 200 employees were laid off with a loss on the year of $68Mln. Once again TD bank stepped in with $30Mln CDN in financing. A contract for $44Mln CDN was issued by an unnamed customer, and later the contract was said to be worth $50Mln CDN causing the shares to shoot up 36%, back to $7.75. This was followed swiftly by a Canadian Space Agency (CSA) grant for $20Mln CDN in April 2000. Once again the government helped save the day. Last Week: O'Donovan Grows His Team (and his Company) as part 2 of "A Short History of COM DEV International" continues! Next Week: Into the 21st Century as part 4 of "A Short History of COM DEV International" continues! 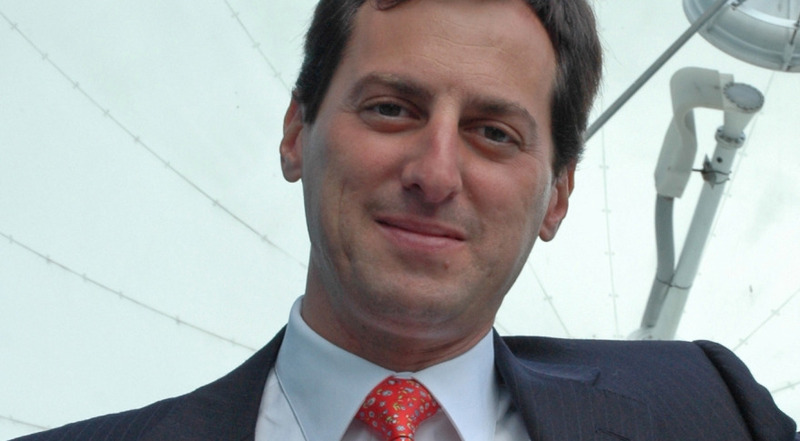 The Strasbourg, France based International Space University (ISU), founded in 1987 by X Prize Foundation founder and chairman Peter Diamandis, human space exploration advocate Todd Hawley and serial space entrepreneur Robert D. Richards, is seeking bids from American educational institutions to establish a permanent US based campus. ISU founders Diamandis and Richards celebrating its 25th anniversary in 2012. In the beginning, at least according to Richards, "the first "I" in "ISU" was Canadian," although, as outlined in more recent reports such as the June 18th, 2012 post "Canadian Space Agency "Pulling Financial Support" for International Space University," the statement is less accurate these days. Todd Hawley, the third ISU co-founder died in 1995 from complications from AIDS. His ashes were later shot into space along with the ashes of Gene Roddenberry, Timothy Leary and 21 other founding thinkers and supporters of space exploration. Screen shot c/o ISU. As outlined in the February 9th, 2016 press release, "ISU Seeking US partners to Compete to Host New Space Entrepreneurship Institute," the new campus location, to be called the Robert A. Heinlein Institute for Space Entrepreneurship & Space Innovation (after the acclaimed and controversial science fiction author) will offer training, conduct research and host events pertaining to the emerging global commercial space industry. The move is a considerable broadening of the ISU's mandate that promises to bring new players and new perspectives to the space sector. The ISU is an unaccredited educational institution that serves as a global nexus for space scientists and engineers. 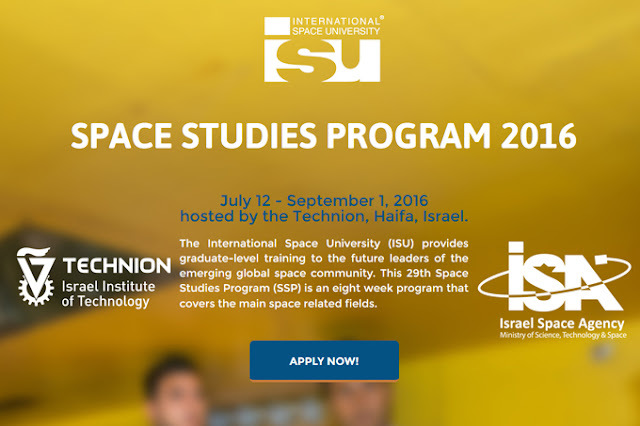 The ISU offers a Master of Science in Space Studies (MSS) degree as well as its flagship Space Studies Program (SSP), a multidisciplinary professional development workshop held every summer at various locations around the world. Supported by various national space agencies and other organizations from around the world, the ISU's faculty currently stands at 100 members. Over 4,000 students from over 100 countries have graduated from the ISU. ISU 2016 poster. Graphic c/o ISU. The rise of NewSpace companies like SpaceX, Blue Origin, Bigelow Aerospace and Planet Labs highlight the evolution of space from a static government dominated sector to a growing business-oriented one. This evolution has spurred a need for skill-sets outside of science and engineering. A similar evolution occurred in the information technology sector. In its first decades, the computer industry comprised only a few firms and a small, narrowly focused workforce. Later, as computer technology became democratized and widespread, the computer industry grew and diversified (even subsuming other industries like telecommunications). The more evolved information technology industry required skill-sets beyond the traditional programming and hardware design. With growth came new jobs and new career specializations like web development, network design and operations support. A new duality emerged; those who created new technologies and those who built and maintained new infrastructures that utilized them. According to Commander William T. Riker (played by actor Jonathan Frakes, on the right) in the Star Trek: The Next Generation episode, "The Royal," when the train comes in, "everybody rides!" Photo c/o Startrek.com. The Robert A. Heinlein Institute for Space Entrepreneurship & Space Innovation could become both industry incubator and training ground for the next generation of space workers. A virtuous cycle may emerge; a growing space industry acquiring a growing labour force would wield greater influence both in government and society at large. The space startups of today could grow into the Googles, Apples and Facebooks of tomorrow. Interested US institutions have until February 29th, 2016 to submit their bids using these request for statements of interest documents. The ISU will make their final selection for the Heinlein Institute in September. Not unlike a newborn baby bird, exactEarth Ltd. of Cambridge, Ontario has to fight a nest-mate for a worm even before the company’s new-bird smell wears off. 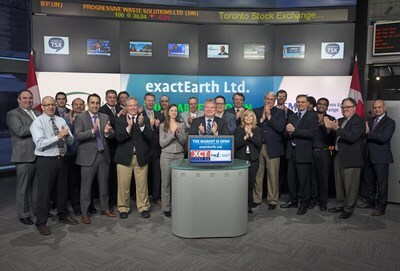 exactEarth Ltd. (XCT) CEO Peter Mabson (center, at the podium) joined Rob Peterman, the director of global business development for the Toronto Stock Exchange and quite a number of others, to open the TSX on February 11th. The company was first listed on the TSX only two days earlier, on February 9th. Photo c/o CNW Group/TMX Group Limited. The week before, exactEarth officially became a stand-alone company. 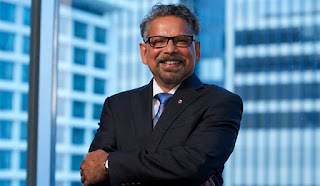 They were spun off when parent company COM DEV International Ltd. was sold to US-based Honeywell International, as outlined in the January 24th, 2016 post, “Did the Government Let COM DEV Go Because They Have Bigger Fish to Fry?” In their first test as a separate company, exactEarth is looking to keep a Canadian government contract, set to expire this March, away from a foreign competitor. As outlined in a February 12, 2016 SpaceNews article, “Orbcomm, exactEarth compete for key Canadian satellite-AIS contract,” exactEarth currently provides maritime surveillance data to the Canadian government. Their competitor for the contract is Orbcomm Inc. of Rochelle Park, New Jersey. Orbcomm would say the competition is local, not foreign, because the official bidder is Skywave Mobile Communications of Ottawa. Seeing as how Orbcomm bought Skyway in January 2015, as outlined on the January 5th, Business Wire press release, "ORBCOMM Completes Acquisition of SkyWave," it’s not unreasonable to say that only one of the battling birdies is Canadian. 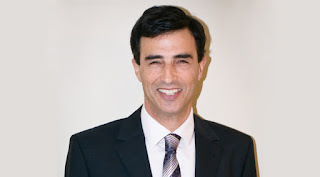 Peter Mabson, president of exactEarth, says in the article that they are optimistic about winning the new contract. The current contract is worth $19Mln CDN, with $7.5Mln CDN of that for selling data to foreign governments. Mr. Mabson said even if they don’t get the new contract, nothing is stopping them from providing data to those foreign governments anyway (It’s always good to have a backup worm in case the first one gets grabbed by a pushy foreign bird). We’ll soon find out how exactEarth’s first solo flight goes. If you hear a splat, just help the little guy up and point him seaward. He’ll be fine. "We have a competitor, but here's the difference," said exactEarth president and CEO Peter Mabson during a February 11th, 2016 BNN interview. Screen shot c/o BNN. As a side note, Mr. Mabson did a February 11th, 2016 video interview on Bell Media’s Business News Network (BNN), “exactEarth: Tracking the world's shipping.” He gave an interesting demonstration of how to avoid an unpleasant question. Mr. Mabson, who seemingly had excellent hearing throughout most of the interview, appeared to go momentarily deaf when asked who exactEarth’s competitors were. The interviewer repeated the question. This time Mr. Mabson heard the question but appeared to have a momentary memory lapse. After all, he’s a busy man and can’t be expected to remember everyone. He simply referred to that company as one from “south of the border” and resumed talking about his company. In case Mr. Mabson reads this, the name of that company you couldn’t remember from south of the border is the aforementioned Orbcomm. They do stuff with satellites. And they like boats. That’s Orbcomm with two m’s. Yes, those companies south of the border can be excessive. A good Canadian company would use a single m.
Who says the Canadian space biz can’t be fun? Cheep, cheep. Oddly enough, the current sale isn't the first time that COM DEV had gone down the path of nearly being purchased by a US firm. In 1976 our story very nearly came to an abrupt end when a Massachusetts based firm expressed interest in purchasing the company; but Val O'Donovan didn’t want to sell, at least according to an interview he gave at the time. Val O'Donovan. Photo c/o Waterloo Region Museum. Over the next three years O’Donovan steadily worked away on building his team. By 1979 the anti-English sentiment growing in Quebec was starting to take its toll on the company. So he chose to move the entire operation, with all 44 of its employees and their families to Cambridge, Ontario, ostensibly because the housing market was depressed there, but also because it was near the University of Waterloo. Just four months later COM DEV would win a $1.5Mln CDN contract from Hughes of California to supply microwave multiplexers. This was followed by a similar contract from RCA for $1Mln CDN. But even a superficial analysis of this big break shows that all roads lead back to RCA. The only reason Hughes was buying anything from Canada was because of the 1969 Telesat Canada Act which, among other things, had also promised Canadian companies a fair shot at any Canadian government satellite business. 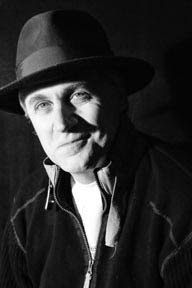 Hughes had been publicly bullied by SPAR Aerospace and RCA in the early 70s into “buying Canadian” because of that government promise. As outlined in part one of this post, it also didn’t hurt that COM DEV wouldn’t have existed at all if it wasn’t for RCA in Montreal. In one respect COM DEV's fortunes were writ large before the company even existed, when the cancellation of the CF-105 Avro Arrow pushed Canada into a world where it had to buy its defense hardware from the United States. That in turn led to the realization that sending such huge sums of money south required a quid pro quo, or Canada would soon become bankrupt. 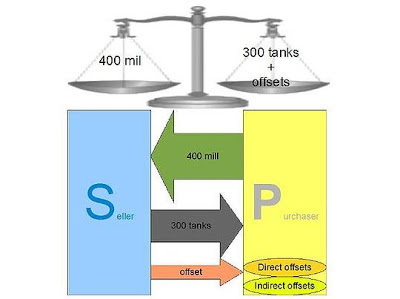 A sample off-set agreement, with a supplier providing 300 tanks for $400 million dollars, plus a series of direct and indirect offsets which are then passed along to local companies for a variety of services. As outlined in the January 23rd, 2013 post "Buy Canada: New Firm Tracks IRB Offsets," Canadian government policies have traditionally been set-up to insure that foreign firms with Federal defence, aerospace (including space) and security contracts spend money in Canada comparable to the value of the contracts received. Graphic c/o Wikipedia. The solution was the notion of off-sets, whereby if Canada bought millions of dollars in fighters from the United States, then the companies building those fighters would have to buy and invest in Canadian defense technology companies. That system was entrenched by the time COM DEV first started to find its feet. It wasn't invented by them, it was the world they had to live in. 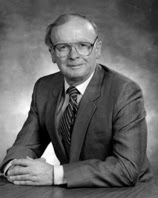 In 1981 O’Donovan managed to tap into another well of Canadian government assistance, this time it was the research being done at the National Research Council on so-called “Surface Acoustic Wave” (SAW) technology. The essence of SAW was that specific materials can be used to convert acoustic waves to electrical signals and vice versa. The real value of this technology to COM DEV was its ability to create reliable and accurate pass bands in radio receivers. O’Donovan’s original strength had been in creating systems where many frequencies could be received and transmitted from a single “multiplexer.” SAW had the potential to make them even smaller and more reliable. Today SAW is used in everything from your touch-screen phone to your garage door opener. 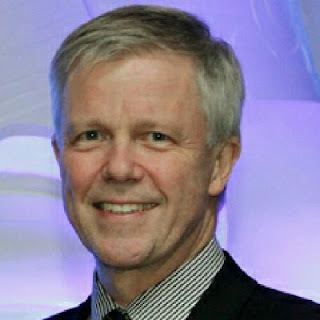 O’Donovan managed to pry a $300,000 grant from the Department of National Defence (DND) to perform R&D with SAW. Within a year COM DEV was evidently big enough to compete for part of a $400Mln contract to install radar systems for Canadian Air Traffic Control. Within another three years O’Donovan and his team, which now also included his RCA partner Kudsia, who was the company's chief scientist, had managed to place their multiplexers in 34 of the western world’s satellites. In May of 1985 they received another contract with DND for $448K CDN to supply radar systems. [ii] They won the Canada Award for Excellence in Innovation and won a piece of the coveted European Remote Sensing (ERS) satellite contract, as well as a further $5Mln CDN for an Italian satellite. 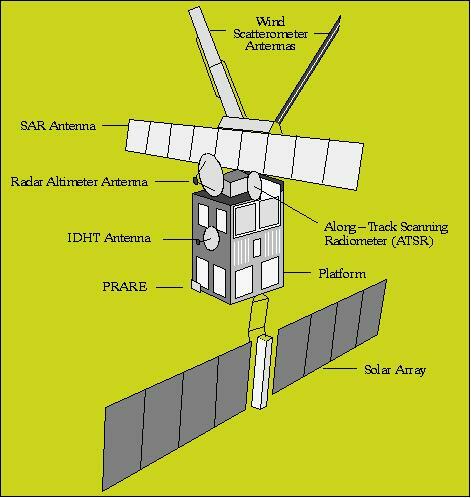 Graphic showing the major components of the first European Remote Sensing satellite (ERS-1), one of two satellites in the European Space Agency's (ESA) first Earth-observing satellite programme to use a polar orbit. The satellite was launched on 17 July 1991 into a Sun-synchronous polar orbit at an altitude of 782–785 km and provided Earth imaging and environmental monitoring, mostly in the microwave spectrum. Graphic c/o eoPortal. Later in 1985 they submitted an official proposal to NASA to build a “space junk” detection radar for the proposed space station project. That July they received a grant from the Government of Canada for $800K to create jobs, but then promptly laid off 18% of their staff. This was the first in a series of curious periods when COM DEV would frequently follow good news with an almost immediate dose of bad news. The peaks and valleys of space work were to become only too apparent. Things would get tougher in 1986. The loss of the space shuttle Challenger brought the US space program to an abrupt halt and contracts started to dry up. COM DEV almost didn’t survive. But O’Donovan had insisted that the company continue to pursue R&D on new products, and since the government of Canada was paying half the costs of that R&D it was a wise decision. By 1989 they were on a hiring spree again, in large part due to a $3M DND contract. By the summer of 1990 COM DEV employed 400 people and was expanding. They had received more money from Ottawa in the form of a piece of the RADARSAT contract. They signed a $25M deal with Inmarsat in July of 1991, using the SAW technology they had acquired from the NRC, and the management promptly announced that they would be expanding into the UK when they bought 30% of Phase Devices Ltd.
Val O'Donovan wrote an October 7th, 1992 editorial in the Globe and Mail about how his childhood was inspired by the writings of Arthur C. Clarke and called on educational institutions to help train the next generation of Canadian engineering expertise. He eventually went on to become chancellor of the the University of Waterloo. Screenshot c/o The Globe and Mail. A month later they scored a $23Mln contract to work on Intelsat for Loral. This large deal with a major American defense contractor was, perhaps not entirely coincidentally, followed up a few weeks later with an announcement to buy equity in the newly formed SovCan telecom system proposed for the Soviet Union. One can only wonder how the timing of that move was received in Washington. On the back of these large high profile international successes domestic interest seems to have been spurred into action when a few weeks later the Province of New Brunswick gave COM DEV a grant for $191,000, a loan for $550,000 and bought $1.5Mln in company shares in exchange for a new COM DEV plant in Moncton. The company now had 131 satellites with their technology on orbit. They won the Canada Export Award that year with 75% of their sales out of the country. [i] The November 28th 1997 Canadian Business Magazine article, "The Company of Millionaires," by Show Wei Chu. [ii] The July 9th, 1985 Globe and Mail article, "COM DEV Dismisses 36 Workers," by Garry Webb Proctor. Last Week: John Hansen, Samuel Singer and Michael Valentine O'Donovan as part 1 of "A Short History of COM DEV International" begins! Next Week: From Strength to Strength. At Least for Awhile as part 3 of "A Short History of COM DEV International" continues!